I printed him onto white card stock and fussy cut. Zig markers were used to colour in his nose and scarf. A bit of detailing was added to the scarf with a white gel pen. For the background, embossing paste was spread over a snowfall stencil, then sprinkled with iridescent embossing powder. Once everything was dry, the embossing powder was heat set. I love the sparkle. Two torn snowbanks were added at the bottom, along with a simple stamped sentiment. I have more scheduled posts that will be going up on my blog over the next few weeks, so you'll be hearing from me again soon. Even through treatment, you still managed to create a fabulous card. This is so cute, Loll. Good luck with the rest of your treatment. Wishing you good health and a safe and happy holiday season. Just got to smile at this snowman. It will be good to get all your treatment finished in time to enjoy your christmas. hugs Mrs A. My favourite snowman - love his happy smile! 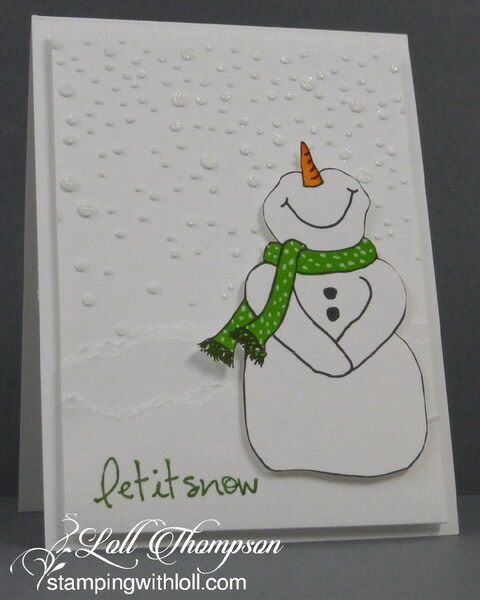 Perfect with that embossing folder and torn snowbanks. Keep your spirits up as you go through the radiation, and know that all of your stamping friends are keeping you in their thoughts. That is the cutest snowman and love the background on this! I first thought it was Bonnie's Kars folder but if SSS makes that, I'm going to have to have it. SO happy you will be done on the 23rd! How great to have that behind you for Christmas! What a sweet design Loll, the background is perfect. fully be finished by the 23rd. You are right, the best Christmas present ever. Get plenty of rest this weekend. This card also causes me smile :-)) Beautifully look the intense colors of the nose and scarf on a white background. Revelation. Loll, I hope that you are well going through radiation treatments. Be sure to take care of much of the skin in the area of radiation. I hope that the doctor properly instruct you how to take care of yourself. I am with you and keep my fingers crossed that the treatment is not bothered you. How can you not smile at this adorable snow man!! Love the simple and textured bg that allows him to take center stage. Sending prayers that your treatments are going as well as they can, my friend!! Your card is just darling. I hope your treatments go smoothly! Oh Loll this is fabulous - glad to hear your radiation treatment 'came early' and you will soon be free of it. Your snowman is just too adorable. Prayers to you during your treatment. I love your snowman card, Loll. So wonderful, fantastic background. I love your happy snowman and the twinkling snow. This snowman made me smile, too! What a fun image. I love what you did for the background as well. Wonderful, happy card! Thanks for the update. Hope you are doing okay. My friend is starting chemo on Monday...bumped up for her, too. Originally they were going to start after the first of the year. Hopefully all goes well for her and for you as well. Hugs!! I'm glad your treatments got moved up and you will soon be finished. You are in my prayers and I hope you are doing well. This is a darling snowman and you can tell by his smile he is so happy it is snowing! I love his bright scarf. Love your smiling snowman such a cute card. I'm glad that snowman makes you smile, Loll. He does me too. As tiring as it is I'm sure you'll be glad that the radiation will be over before the holidays. Keeping you in my prayers. Very sweet card! I love your snowy background and joyful snowman. He is such a jolly snowman! I do hope your treatments go well, with not too much in the way if side effects, so you can enjoy Christmas. All the best for you love seeing your posts talented lady. I live on Vancouver island just across the Salish Sea from you take god care. Hello, Loll! Such a sweet snowman you've done. I want to thank you for being an inspiration in card making as well as personally. I went through my own struggles a few years ago and couldn't manage to do my blog too. Hang in there! I hope they have a gong for you to hit when you're finished your treatments. Go, girl! Have a fabulous 2017! Loll, he's so adorable -- enough to light up anyone's day! And you never need to ask our forgiveness for your absence due to health -- we just count ourselves fortunate when you are around! God bless you, and I pray that your Christmas is a wonderful one! What a sweet snowman! One can't help to smile when looking at him! I am sorry to hear that you can't enjoy the season without the treatments, but on the other hand it will be nice to have it behind you by the time Christmas comes around! I haven't been around much either, just too much going on, but I am still thinking of and praying for you! Hang in there! What a cute little snowman ..... love him! He makes me smile, too. I have kept you in my prayers, so I hope your treatments are finished by now and that you're feeling well :) Sending you hugs and best wishes for a complete recovery! This is such a fun card, Loll! I love that you added snow...it makes your sweet snowman pop!